My boyfriend, Mark, created this one while I was away. He feels that, if people could remember the awe and beauty felt when looking at our planet from afar, they would more likely respect her as they go about their daily lives. It’s easy to forget her beauty when we interact only with a minuscule part of the whole. She is beautiful, she sustains our life, and therefore deserves a great deal of respect. 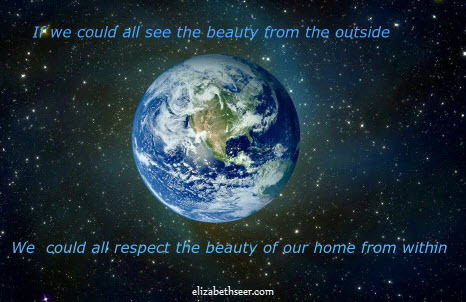 beautiful planet, love our planet, respect our earth, respect our planet, respect the planet. Bookmark.